I admit I am very late to the mineral foundation party. I mean years late! It's not that I was unaware just uninterested. But I'm not trying to deliver breaking news here, just wanting to share a little favourite. I have been using this foundation for ages now and although it is no surprise I haven't yet written about it (considering a distinct lack of activity since the zombies took over my life) I can't actually believe I still haven't written about it! Gah! So here's the story. I was sceptical on mineral foundations. I was sceptical of loose formulations especially. Only because those I had seen wear them just had a cakey kind of finish which is something I'd prefer on a plate rather than my face. (Mmm... cake) It all seemed a bit messy and not very portable. Well. 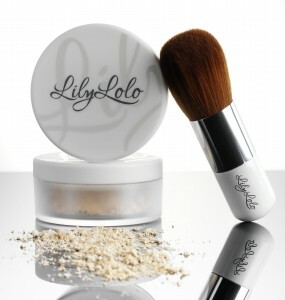 The portable thing is still an issue with me but this, Lily Lolo Mineral foundation, has undone a few preconceptions making my foundation of choice right now - and it has been for many many months. It's very silky. You can really buff it in which is the key to this kind of make up. Buff and double buff. It's simple really and the Super Kabuki brush I bought at the same time makes easy work of this. I bought the shade 'Blondie' after seeing it recommended as a 'suits all' shade for fair skins in some Sunday supplement and I think it probably does. It gives great, buildable coverage (did I mention the need to buff enough?) and a nice subtle glow with matte finish which doesn't even sound possible but it is. I use a layer of Madara Moonflower Tinting Fluid before applying as I like to optimise this glow and boy that really does it. The nice thing about Lily Lolo is that it really is a pure brand. Other mineral make ups of this type can contain fillers, dyes, bismuth oxychloride, nanoparticles etc which is misleading when you are trying to flex a bit of buying power and choose natural. And there are a lot of 'mineral' make ups out there, from practically every major make up house. But not all are made equal. Read the labels and don't be fooled! The bonuses of natural mineral make up are plentiful! There is a natural SPF with titanium and zinc oxide (though this isn't accredited) as these both align on the surface of the skin helping to reflect the sun. Plus both these ingredients can have an anti-immflammatory effect. Since the minerals stay on the surface of the skin (if they aren't nano-sized), nothing gets absorbed which keeps pores clear and prevents anything unwanted ending up in you body and damaging cell health. The absence of liquid means there is no need for preservatives, keeping it even more natural. The Earth has a million colours and somewhere out there is a rock that can be crushed into your prefect match - no need for chemical dyes. And in this particular case, Lily Lolo mineral foundation is really cheap! Half the price of some at £12.49 and of superior quality in my opinion. So that really is a high scoring round. Triple bonus points. P.S. You can get smaller 0.75g samples of all colours from the website and try a selection of colours with their trial kits making it really easy to give it a go. So then. First on the long list of posts I need to catch up on is the.... here we go... Pai Lotus and Orange Blossom BiAffinity Toner. And what a start to the day that is! Now then, this isn't your average toner, where regular water has a nice smell and some clever extracts put in it if you're lucky (alcohol and inactive extracts if you're not), offering little benefit to skin and maybe even drying it out (boo!) No, the Bioaffinity range is different. Made with 'living water' as Pai puts it, that is water taken directly from the plants, which not only contain all the benefits of the plants used but at a pH level that is exactly like skin. So alongside it being pH friendly, you also get the added benefits from the plants themselves. Lotus is very calming (something to do with cutaneous neuropeptides which I don't pretend to understand but am very impressed by) and also helps protect skin from free-radical damage. Orange Blossom has a brightening effect as it stimulates circulation. Great! It is very fresh. It's a very light spritz, not too much of a soaking. The smell is slightly sweet but not over-powering in any way, I can't detect anything orangey but that's OK. I usually go for 2-3 squirts in the morning and evening after cleansing and then apply a facial oil whilst it's still drying to get that extra bit of mileage. Simple really. I can't really skip this step now. I have myself hooked on it. I love a bit of science behind my skincare and the reasoning makes sense to me. I think it's really easy to go overboard when cleansing, stripping the skin of it's natural barrier, even with something as gentle as water. And so bringing back at little life in a handy pump spray in an attractive heavy frosted glass bottle has definitely got my vote. Pai, you've done it again. Well done. 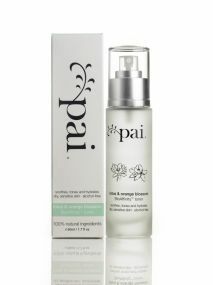 Pai BioAffinity Toners are both £30 available from their website. I admit I have been back in the country for over a week now. Alas, the World War Z days are over. The zombies have been put to bed. My make up kit has finally been cleared out of the hallway and it's about time I got on with the ever-longer list of wonderful things I have to tell you about. Baby, I'm back. OK, LET's GO!